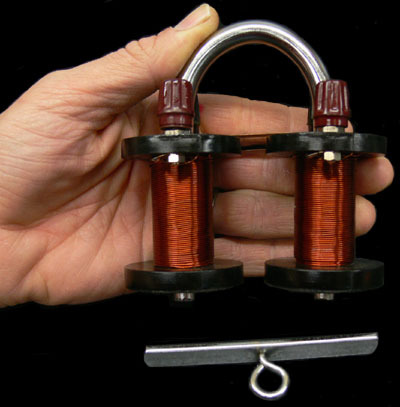 Here's a great Electromagnet for classroom demonstration or general purpose use. The unit actually consists of 2 separate Electromagnets wound around a common steel rod bent into a 'U'. The unit can be completely dismantled and re-configured to your individual project needs. Works with just about any low DC voltage - even as low as 1.5 volts. If you power it with higher voltages (such as 10 to 12 volts), the coils will begin to get fairly hot, so it's suggested that they not be powered continuously at these voltages. The more power fed to coil, the stronger magnetic field it will create and the more it will lift. You can power one coil or the other - or both together, depending on your application. Heavy gauge wire and very sturdy construction make this a pretty tough little Electromagnet. Comes with a small metal plate and eye bolt as shown in the image above for lifting applications.